Metro Detroit’s mortgage industry, which has three of the top 12 home loan companies in the nation, can realize further growth by taking advantage of new business-friendly regulations, investing more in technology, and providing a better customer experience. Matthew and Sara Carrier finally decided to sell the home in Waterford Township where they had lived since 2008. But finding a new home wasn’t easy. For prospective buyers who are serious about purchasing a home, waiting isn’t much of an option. 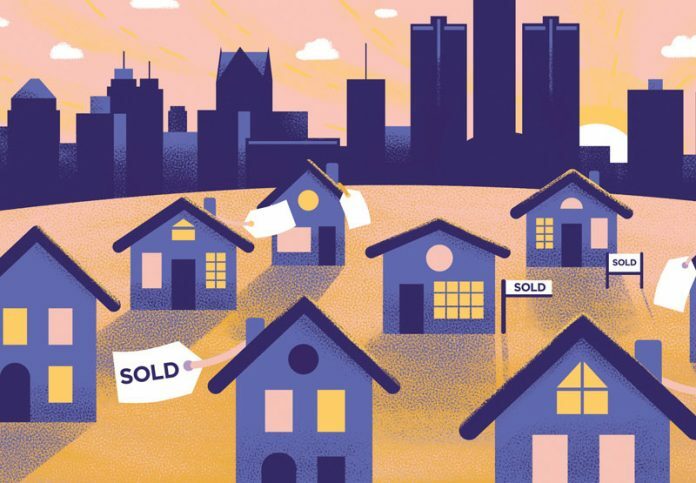 Consider, entry-level homes in metro Detroit have appreciated 16 percent in the past 12 months, while 24 percent of the homes acquired in the region last year sold above the asking price, according to Zillow, which operates a real estate database that lists the condition and estimated value of more than 110 million homes across the nation. The Carriers’ house-hunting eventually had a happy ending. After several months of actively searching for a home, their offer on a house in Clarkston was accepted. They closed in May. Sara says the best part of the process was getting the mortgage. “They held our hands throughout the whole process to make sure it was the least stressful part,” she says. That’s high praise for the mortgage industry, which has had a significant presence in the state for years. Today, Michigan is home to 521 nondepository institutions, 80 state-chartered savings banks, and 141 credit unions. Many of them offer some mortgage products, according to the Michigan Mortgage Lenders Association. 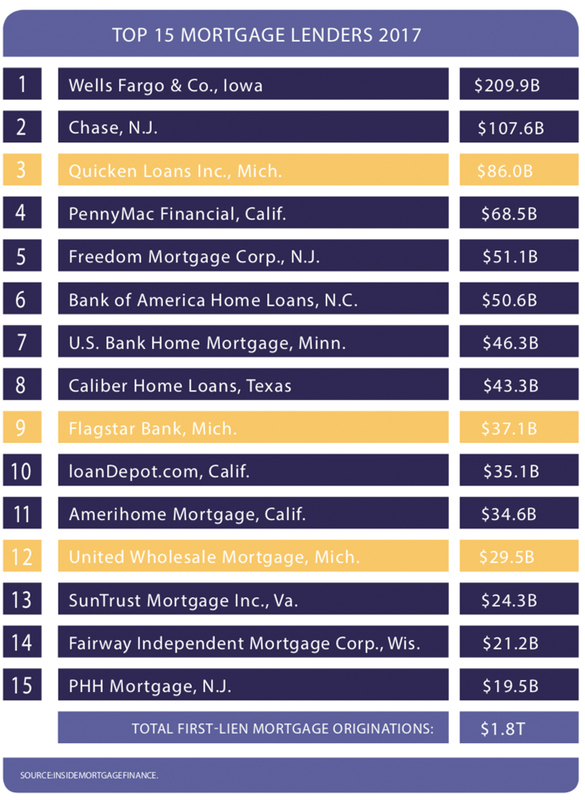 Of the top 12 U.S. mortgage originators, three are based in Michigan, according to data compiled by Inside Mortgage Finance. Quicken Loans Inc. in Detroit was the top lender by retail volume in the fourth quarter of 2017, with $25 billion in loan originations. For all of last year, Quicken Loans was the third-largest mortgage originator in the country, with a volume of $86 billion. Flagstar Bank, based in Troy, posted a loan volume of $37 billion last year, while United Shore in Pontiac, the parent company of United Wholesale Mortgage (UWM), had a volume of $29.4 billion. United Shore’s volume has risen from $13 billion in 2015 to an estimated $41 billion in 2018. “The market has stayed the same, and we’ve taken a huge market share to where, now, one in 40 mortgages in America come through our company,” Ishbia says. To accommodate United Shore’s 2,400-plus employees and organic growth, the company recently moved from Troy to a newly renovated facility in Pontiac that once was home to Hewlett Packard and General Motors Co. At 610,000 square feet, the new space is more than twice as large as United Shore’s former headquarters at Maple Road and Stephenson Highway. Terms of the 2017 deal were not disclosed, but Ishbia says he’s paying “about the same per square foot” in Pontiac as he did in Troy. 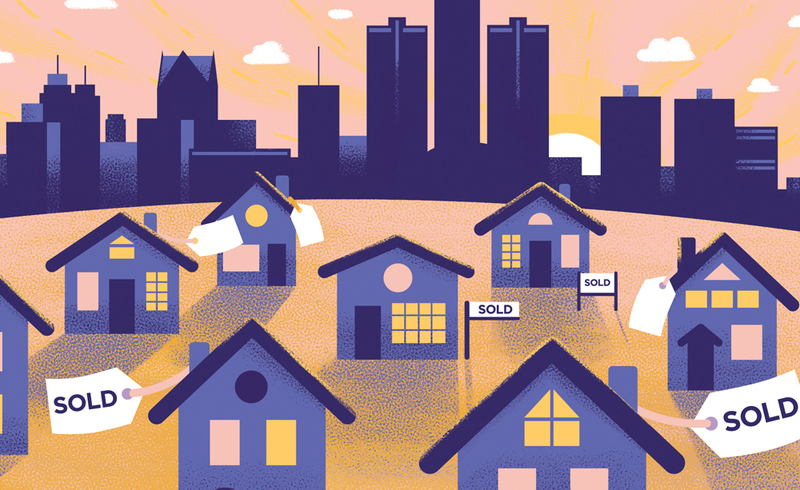 Between Quicken Loans Inc. in Detroit, Flagstar Bank in Troy, and United Wholesale Mortgage in Pontiac, the latter company has shown the highest percentage gain in retail volume between 2013 and 2017. Source: Inside Mortgage Finance. Flagstar Bank in Troy offers mortgage products through all channels, including retail and direct-to-consumer loans, but the vast majority of its volume is generated with third-party originators. Through several recent moves, the bank has been looking to fine-tune its strategy. In early June, Flagstar announced it would acquire 52 Wells Fargo Bank branches in Michigan, Indiana, Wisconsin, and Ohio, while in March it acquired eight branches of Desert Community Bank in San Bernardino County, Calif., with nearly $600 million in deposits, from East West Bank. In April 2017, the bank acquired certain assets of Opes Advisors Inc., which had a mortgage banking business that generated retail originations from 39 retail locations in California, Oregon, and Washington. While low unemployment and tax breaks stoke a growing economy, the mortgage industry faces headwinds. “With 30-year interest rates nearing 4.8 percent, 80 percent of homeowners have no incentive to refinance,” says Mike Fratantoni, chief economist at the Mortgage Bankers Association in Washington, D.C. “Refi volume has dropped 40 percent from 2016 to 2017, and we think it’s going to drop another 30 percent in 2018.” He also predicts a 5-percent decrease in total industry volume in 2018, and notes that the average profit on a loan origination has shrunk to 0.4 percent of volume from 0.6 percent of volume. To help boost its retail business, last year Flagstar Bank began utilizing Lenderful, an online mortgage application portal developed by MadDog Technology in downtown Birmingham. The latter company, co-founded by Peter Karmanos Jr., former chairman and CEO of Compuware Corp. in Detroit, designs enterprise software to create digital tools like Lenderful’s cloud-based mortgage origination platform. In another plus for the industry, community banks in Michigan and throughout the country stand to benefit from the Economic Growth, Regulatory Relief and Consumer Protection Act of 2018 that President Donald Trump signed into law in May. The bill rolled back rules that had restrained banks from making certain types of loans, while providing for a more business-friendly Consumer Financial Protection Bureau. For example, with the new act lenders with less than $10 billion in assets would be exempt from Dodd-Frank’s mortgage underwriting standards as long as they keep a loan in their portfolio and do not sell it. Also, banks with less than $10 billion in assets would be exempt from the Volcker rule, which bans banks from making speculative bets.